We were delighted to find at the NSW Premier’s History Awards on Friday that both our shortlisted books were named winners. 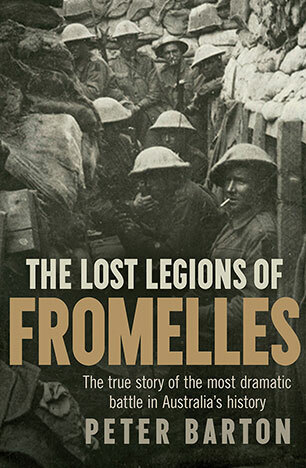 The Lost Legions of Fromelles by Peter Barton joint winner of the First World War History Prize, while Babette Smith’s The Luck of the Irish took out the NSW Community and Regional History Prize. Huge congratulations to both Peter and Babette! Peter Barton’s The Lost Legion of Fromelles is a monumental study of a 1916 battle that has come to the forefront of Australians’ consciousness in recent years as the most catastrophic 24 hours in our nation’s experience of war. Barton’s work contextualises this battle by exploring the conflicts that preceded it (which were disturbingly similar). With unprecedented access to the archives of the Bavarian Army, he is able to strip away the sentiment, mythology and censorship that influence our understanding of the war on the Western Front. The book’s startling discoveries include revelations that captured Australian soldiers were willing to impart information to their captors without coercion. It gives a fearless critique of elements of Australia’s official World War I history, along with chief architect Charles Bean’s willingness to gloss over or obscure unpleasant realities that were antithetical to the Anzac legend. By examining contemporary efforts to identify allied soldiers buried in mass graves at Pheasant Wood, Barton connects insights into the past with how they play out in the present. The Luck of the Irish is an original and sophisticated analysis of the Irish in parts of New South Wales during the nineteenth century. Based on extensive research of primary and secondary sources, it gives particular attention to the convict experience. Beginning with the 1835 wreck of a ship carrying convicts, Babette Smith skilfully traces what happened to those on board, both the convicts and the people who guarded them. The wreck is used as a springboard for a study of Irish convicts and others associated with them in the 1830s and beyond. Through a focus on numerous case studies, Smith shows how the survivors contributed to New South Wales’s economic and social development and played a crucial role in the emergence of a distinct Australian identity. In doing so, she gives careful attention to the localities where they settled. Among the more surprising findings is that the Irish were largely responsible for religious equality in Australia. Beautifully written and convincingly argued, this book builds on the author’s previous work but is refreshingly original. 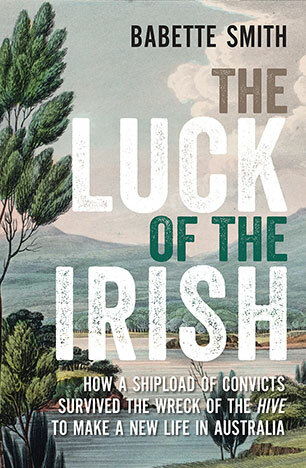 The Luck of the Irish is a work of considerable scholarship and interpretation, a major contribution to our understanding of community, urban and regional history in New South Wales. In weaving together the story of individuals and place, Babette Smith brings to life the wider narrative of how these survivors contributed to the state’s economic and social development. She reveals their important role in the emergence of a distinct Australian identity. Of particular significance is her contention that the convict Irish brought a culture with them that shaped and reinforced Australian egalitarianism. The Luck of the Irish is well located in a wider historiographical context, beautifully written and convincingly argued.